Our sawmill is a Wood-Mizer LT40HD portable band sawmill equipped with full hydraulic log handling and a 29 hp fuel injected gasoline engine. 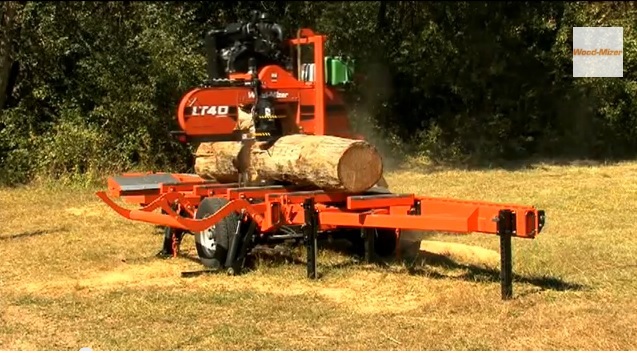 The Wood-Mizer LT40 sets the standard in the industry for portable sawmills. Wood-Mizer is the leader in the portable thin-kerf bandsaw industry and manufactures some of the most reliable, robust sawmills available. Band sawmills use flexible thin-kerf blades to do the cutting. The gap left behind as the blade cuts through the wood is called the kerf and a thin kerf means more usable lumber and less waste. Computer setworks that control the sawmill's blade height. The setworks allow us to make repetative cuts with speed and precision right down to the saw deck. Fully hydraulic log handling allows the sawmill to quickly and safely load your logs and position them for optimal lumber yield. Auto-lube allows precise control of the blade lubricating fluid which, for certain types of wood, can be critical to milling straight, accurate lumber. Extra back-stops allow us to handle shorter logs. 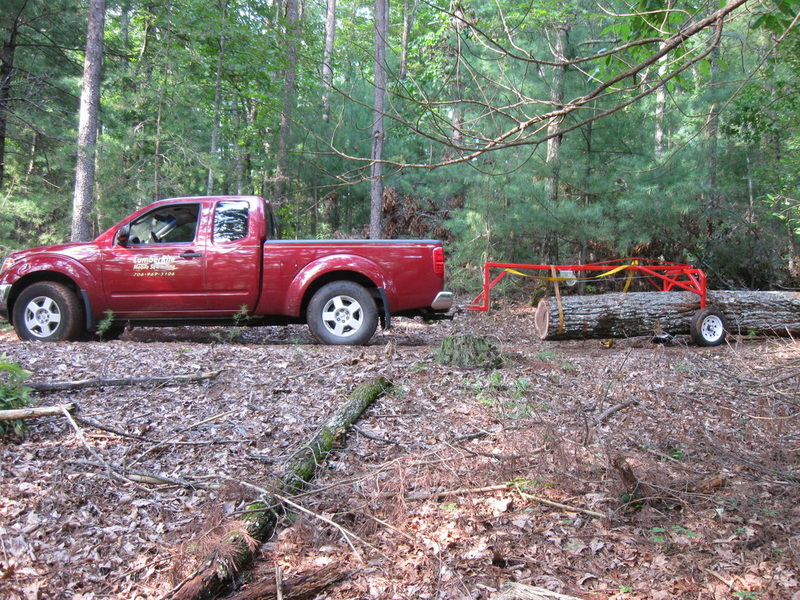 Many portable sawmills come standard with only two back-stops spaced six feet apart. Our Wood-Mizer LT40 is equipped with four hydraulic log stops which allows us to handle high-value logs as short as three feet. Ideally all the logs on a sawmilling site should be positioned in one location with the log centers lined up to each other. In those instances when they are not, we can use our custom made, multi-function log arch to do a limited amount of log moving. 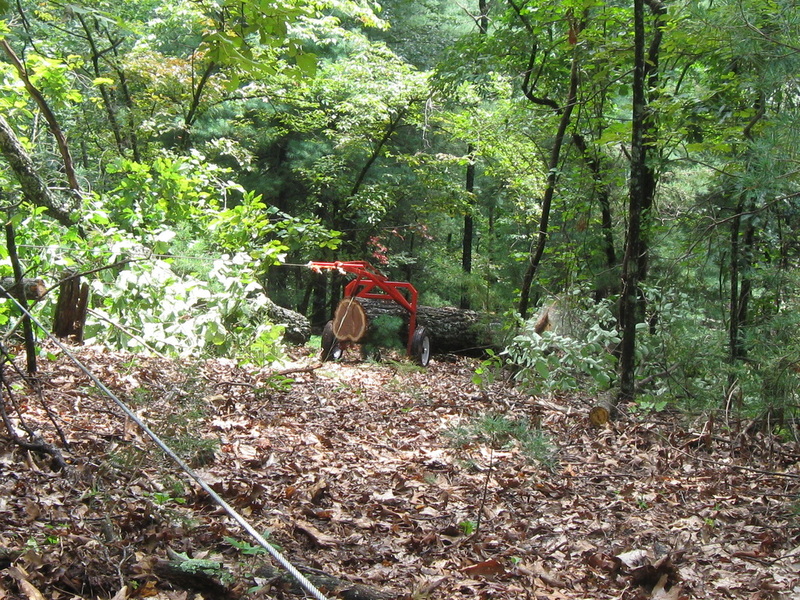 The log arch can handle logs up to 30 in diameter and 20 feet long weighing up to 4500 pounds. In the two-man T-handle configuration medium sized logs can be moved fairly easily on level ground. In the tow-ring configuration the arch can be connected to a vehicle or winch via a rope and used to pull logs up fairly steep slopes using the toggling or "fetching" action. The tow tongue/winch winch option allows the arch to lift and move large logs easily on level ground. The tongue can be connected to a 2 inch towing ball of a tractor, truck or ATV.